Rick's Blog: We're flying high! We’ve been so busy at the nest so I have been a bit quiet, but we finally found a bit of time to update the Kids website! Rick recaps the 2017 John Worsfold Medal and previews the exciting Trade Period! Rick is gearing up for West Coast's night of nights - the John Worsfold medal! The boys beat the Blues on Saturday, but we've got a Giant task ahead of us this weekend! Rick's blog: Eagles heave ho! Are you ready for Thursday night footy? Are you excited for Friday night footy? Are you ready for a Thursday night special? Rick’s Blog: Woo hoo, footy’s back! Rick's Blog: Merry Christmas to all! Rick's Blog: Summer's almost here! We're off to Adelaide to play the Crows! We're ready to face the Hawks at home! We're off to Sydney to face the Giants! Are you all ready for the Western Derby this weekend? We're aiming for six straight wins against Collingwood this weekend! 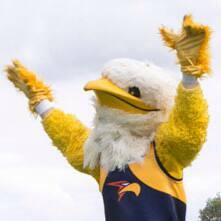 The Eagles are ready to Dig Deep against Melbourne this Saturday! We're off to face Carlton at the MCG!